Moscow (AFP) - Mikhail Ustinov's ancestors were executed in 1917 for supporting the tsar but a hundred years later the 68-year-old yearns for the return of monarchy to Russia. "Russians are monarchists in their soul, even though the Soviets tried to destroy our soul," Ustinov, who is a self-proclaimed spokesman for the Moscow monarchist community, told AFP in his small apartment on the outskirts of the Russian capital. Since the breakup of the Soviet Union in 1991, Ustinov has dressed in stylized military fatigues in a nod to the officers of the Tsarist army who were fiercely loyal to the monarch and heavily persecuted after the October Revolution. Executed with his wife and children by the Bolsheviks in 1918, the last Russian tsar Nicholas II was rehabilitated and buried in Saint-Petersburg in 1998 and canonised in 2000 by the Orthodox Church. "I want to die wearing my uniform and declaring love for the tsar, like my grandfather, great-grandfather and all of my family," said Ustinov, a portrait of Nicholas II behind him. Ustinov said his family was decimated during the revolution, which he calls a "coup d'etat." More than 28 percent of Russians are in favour of the country becoming a monarchy again one day, according to a study by VTsIOM, a state pollster, released in March. That figure increased from 22 percent in 2006. Monarchy sympathisers are especially prevalent among the younger generation: 33 percent among those between 18 and 24 years old and 35 percent of 25-34 year-olds. "We see clearly that the 'Soviet' generations resist this idea more than the younger people, for whom monarchy is one possible system of governance," said sociologist Stepan Lvov who helped organise the poll. "It's as if the Soviet vaccine doesn't work on them," he added. On the contrary, for young Russians monarchy is "rather attractive for its rationality and effectiveness," Lvov said, adding they no longer see it as the antithesis of liberty and democracy. Born after the collapse of the Soviet Union, Pavel Markov is someone who sees monarchy as a "more adequate and balanced system" than the current political regime in Russia. "Democracy doesn't suit Russians, our mentality needs authoritarian and centralised power," said the young history teacher from Nizhny Novgorod, a city some 400 kilometres east of the capital. "A constitutional monarchy allows us to consolidate our traditional values to give strength to the people, who are struggling today," he said. Being a monarchist is "inseparable" from the Orthodox faith, the predominant religion in Russia, he added. And for others, Russia has already become a monarchy of sorts, with President Vladimir Putin reigning over the country for 18 years and widely expected to extend his rule by another six years in a 2018 vote. "Vladimir Putin is already a tsar, he acts like a tsar," said Yelena Melnikova, who studies Orthodox icon restoration. The 22-year-old believes that eventually the monarchy will replace the "political hypocrisy" of today's Russia and mark the return of "real Russian values". Putin himself has flatly dismissed any comparisons to a monarch, saying in 2005 that the title of tsar "doesn't suit" him. But he made overtures to the powerful Orthodox Church, which has never opposed the Kremlin on political matters in public. Critics accuse Putin of paying lip service to the constitutional separation of church and state by giving clerics ever more influence over secular institutions. Sociologist Lvov said younger Russians tend to romanticise monarchy and view it as an alternative that offers "order and predictability" in an unstable world. "A return of monarchy remains largely unpopular and improbable," he added. The figure of Nicholas II remains a source of intense debate, with the new biopic "Matilda" about his love affair with a ballerina sparking a violent backlash from radical Orthodox activists. 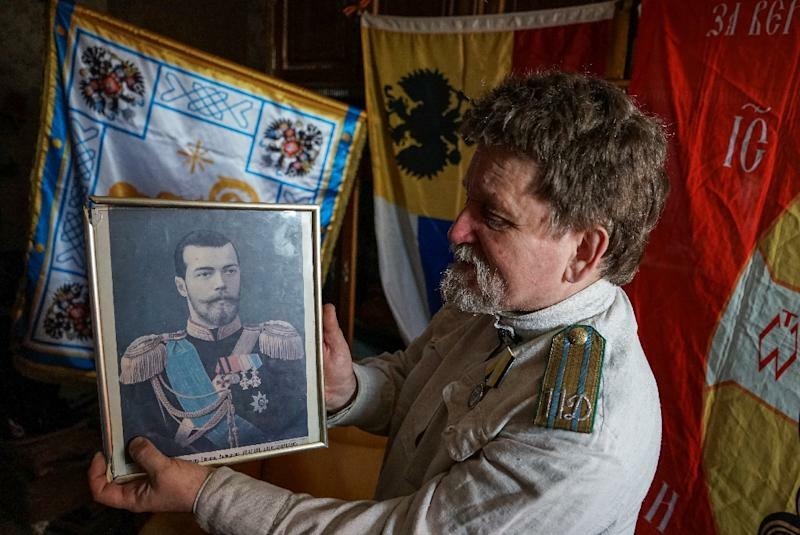 "The film insults the feelings of Russians for whom the tsar is like their father," said Andrei Kormukhin, head of the ultra conservative group Sorok Sorokov, sporting a T-shirt with the image of Nicholas II. "We need monarchy to return to save Russia," he told AFP. Back in his apartment, Ustinov plays a song in honour of the last Russian emperor. "I am awaiting the tsar's return like some people await the Messiah," he said.